As staff of the ranch, I had the opportunity to attend this special wilderness experience, and without more reflections, I grasped it. You can read on the website here that if you want to learn knowledge that you do not have easily access in your modern society but human beings have for millennia, the survival instructors will teach you. Then, the willingness to learn would therefore guarantee your success. Learn this kind of skills that will open the wilderness up to you, but not only, because it will make you more confident and serene with your place in the biosphere and your relationship with nature. Skills and unique experience of nature that will allow you to replace any fancy equipment with knowledge and let you thrive rather than survive in the outdoors. Bushcraft Experience will increase your comfort in wilderness settings. We learnt to create everything you need that you don’t think every day as a spoon and a bowl to eat as at home and even more comfy and original, so how to concretely use fire as a carving tool to your essentials three times a day. You have to forget the time, to live to the rhythm of the sun in the middle of the forest and to create your tools slowly, or you will do it wrong ! By adapting to your surroundings and using the materials that nature provides, you will learn to craft the items you need to live in harmony with nature, and at nature’s pace. The quote I will remind is ‘We can carry a ton of equipment or a ton of knowledge’, and carrying a ton of equipment will just used your body, particularly your back and wear your nerves out, whereas the ton of knowledge will just encourage your curiosity and develop your willingness to be in nature and to learn from experience. Essential equipment can be a knife, an axe and a handsaw, so it’s not insurmountable, for a 14 years old person to a person any age you want with motivation, to carry it in a backpack. More personally, at the beginning of the course I wasn’t confident with using a knife like I didn’t know by what I should start to use a knife safely and what exactly you can achieve with a knife. 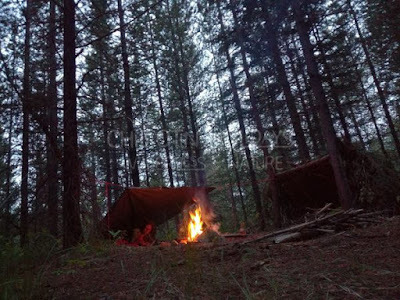 For sure I have been particularly surprise of the extent of all the utilities of an eight-centimeter blade knife, and especially to quickly create my natural shelter for 2 persons with a huge, warm and comfortable bed. I assure you that after discovering and practicing the navigation into the wild with a map and compass, and without ; the animal tracking ; the wild edible and medicinal plants finding and preparing ; start your night fire with one of the lighting techniques you learned, you will need a good rest in your natural bed smelling the good scents of pine branches.